Norwegian Air has come to an agreement with both Airbus and Boeing to reschedule the delivery of its aircraft to reduce its capital spending. Norwegian has also reported its first quarter results. The quarter was characterised by reduced costs, increased revenue and significantly improved on-time performance. The net loss was NOK 1,489 million ($171.7 million), while the company’s unit cost excluding fuel decreased by 8 percent during the same period. The total revenue was NOK 8 billion, up 14 percent. Norwegian’s key priority is returning to profitability through a series of measures, including an extensive cost-reduction program, an optimized route portfolio and sale of aircraft. The company’s internal cost reduction program #Focus2019 has been implemented, achieved cost reductions were NOK 467 million this quarter. The company has also strengthened its balance sheet through a fully underwritten rights issue of NOK 3 billion, which secures a stronger financial position. The company is well positioned to continue to attract new customers, not least in the long-haul market, where the development is stronger than in the short-haul market. For the first quarter, the total revenue was NOK 8 billion, an increase of 14 percent from the same period last year, primarily driven by intercontinental growth and increased traffic in the Nordics. More than 8 million passengers flew with Norwegian this quarter, a growth of 9 percent. The load factor was 81 percent. The company’s unit cost excluding fuel, decreased by 8 per cent compared to the first quarter in 2018. The punctuality increased significantly this quarter, from 73 to 81.3 percent. The regularity was unchanged at 98.7 percent. “I’m pleased with the positive developments this quarter, despite the 737 MAX issues. We have taken a series of initiatives to improve profitability by reducing costs and increasing revenue. We are optimising our base structure and route network to streamline the operation as well as divesting aircraft, postponing aircraft deliveries and not least implementing our internal cost reduction program, which will boost our financials. I am also pleased that booking figures and overall demand for the coming months look promising,” said CEO of Norwegian, Bjørn Kjos. In March, Norwegian temporarily suspended operation of 18 Boeing MAX 8 aircraft. 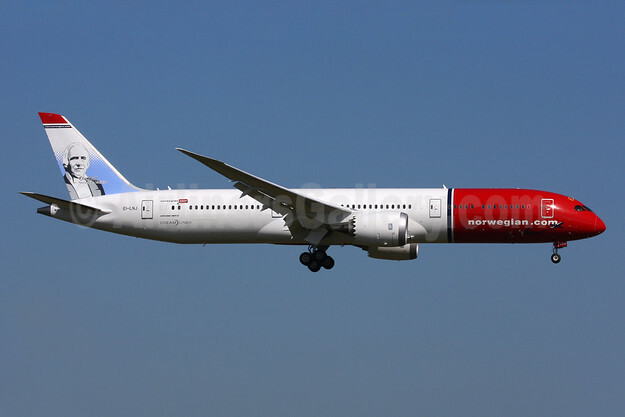 The company combined flights and booked customers to other departures within Norwegian’s own network, consequently reducing the impact on passengers. The company will continue to limit passenger disruptions by also offering flights with wetlease companies whenever necessary. The number one goal is to operate its schedule according to plan. “Our dedicated colleagues at Norwegian have been working day and night to find solutions for our customers. They will continue to do their utmost to ensure that all flights continue to depart as planned, regardless of how long the MAX stays out of service,” Kjos continued. Top Copyright Photo (all others by the airline): Norwegian Air Shuttle (Norwegian.com) (Norwegian Long Haul) Boeing 787-9 Dreamliner LN-LNR (msn 38784) (Freddie Mercury, British Rock Legend) AMS (Ton Jochems). Image: 946289. This entry was posted in Norwegian (Argentina), Norwegian Air International, Norwegian Air Norway, Norwegian Air Shuttle, Norwegian Air UK, Norwegian Long Haul, Norwegian.com, Norwegian.com (Norwegian Air Shuttle) and tagged Boeing 787-9 Dreamliner, Freddie Mercury British Rock Legend, LN-LNR, msn 38784, Norwegian Air Shuttle (Norwegian.com) (Norwegian Long Haul) on April 25, 2019 by Bruce Drum. Norwegian Air’s largest cabin crew union in France has called for a strike from April 24 to April 26, seeking higher pay and better working conditions, a union representative said on Saturday. UNAC union representative Anastasia Durand told Reuters the union represents 70 percent of the airline’s 158 cabin crew based at Charles de Gaulle airport in Paris, also known as Roissy, from where Norwegian has four or five flights per day. Durand said there had been no formal vote for the strike but the union had sounded out staff and there was general support for the action. She didn’t say if any talks were planned with the company. Top Copyright Photo: Norwegian Air Shuttle (Norwegian.com) (Norwegian Long Haul) Boeing 787-9 Dreamliner LN-LNU (Babe Ruth, American Athlete) AMS (Ton Jochems). Image: 946250. 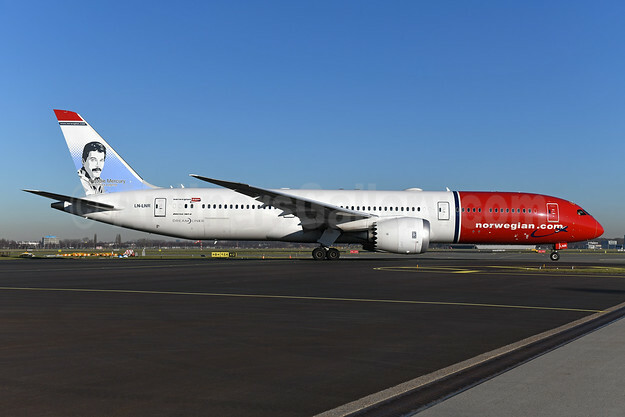 This entry was posted in Norwegian Air Shuttle, Norwegian Long Haul, Norwegian.com and tagged Babe Ruth, Boeing 787-9 Dreamliner, LN-LNU, Norwegian Air Shuttle, Norwegian Air Shuttle (Norwegian.com) (Norwegian Long Haul) on April 22, 2019 by Bruce Drum. Europe’s third largest low-cost carrier flew 5.8 million passengers from the UK and Ireland and launched more than 15 routes in 2017. Some of its successes include commencing groundbreaking transatlantic flights from Scotland, Belfast and Ireland to smaller US east coast cities and taking low-cost long-haul global with the world’s longest low-cost route between London and Singapore. Norwegian’s first route to South America – On February 14, 2018, Norwegian will launch its first route to South America with a brand new direct service from London Gatwick to Buenos Aires available from £299 ($406.20) one way. Four flights per week on the 787 Dreamliner will unlock more affordable travel to Argentina, offering travellers access to a unique mix of European and Latin American culture. New enhanced Premium cabin to fly on the 787 Dreamliner – Norwegian will introduce an expanded Premium cabin which will have 60% more seats for passengers wanting an enhanced experience. The new 56 seat cabin configuration will offer passengers more than a metre of legroom and 11” Panasonic monitors providing hours of complimentary inflight entertainment. The new cabin will be fitted on Norwegian’s final 20 787 Dreamliner orders set for delivery from February onwards. Chicago and Austin to become newest US destinations – Norwegian will add Chicago and Austin to its growing list of long-haul destinations from London Gatwick this spring. From £149.90 ($203.65) one way, holidaymakers and business travellers can fly daily to the Windy City which launches on March 25, 2018. From March 27, 2018, Norwegian will commence a new three weekly service to Austin, Texas, known for its world-famous cultural scene and for providing the backdrop to the South by Southwest (SXSW) festival. Direct flights are available from £164.90 ($224.00) one way. Introducing Wi-Fi on more state-of-the-art aircraft joining Norwegian’s fleet – Norwegian will add 11 Boeing 787 Dreamliners to its fleet in 2018 which are exclusively used on long-haul routes from London Gatwick. 10 of these new aircraft will feature the enhanced Premium cabin. Meanwhile 12 new Boeing 737-8 MAX 8 aircraft will land in Norwegian’s fleet this year to service the carrier’s transatlantic flights from Edinburgh, Belfast and Ireland to the US east coast. Later in 2018, Norwegian will begin to rollout inflight Wi-Fi on long-haul routes that will keep passengers connected in the skies. 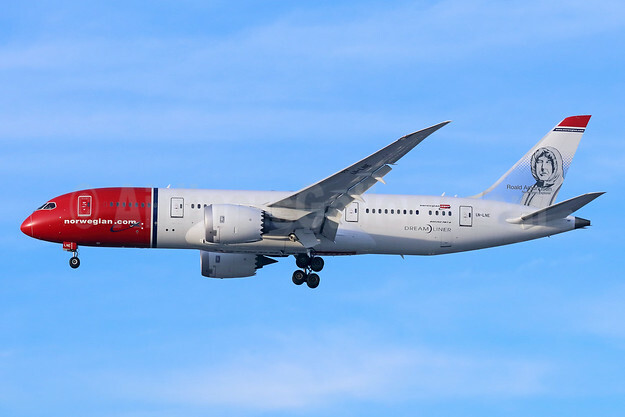 Daily Boston flights and planned increases for Oakland and LA – Next spring, Norwegian will increase the number of flights on some of its most popular routes from London Gatwick. Boston increases from five weekly flights to a daily service with fares from £134.90 ($183.28) one way. Plans are underway to increase Oakland-San Francisco to a daily service and more flights are planned to Los Angeles, with twice-daily departures on select days of the week. Copyright Photo: Norwegian Air Shuttle (Norwegian.com) (Norwegian Long Haul) Boeing 787-9 Dreamliner EI-LNJ (msn 37308) (Ole Bull) LGW (SPA). Image: 932556. This entry was posted in Norwegian Air Shuttle, Norwegian Long Haul, Norwegian.com and tagged Boeing 787-9 Dreamliner, EI-LNJ, LGW, msn 37308, Norwegian Air Shuttle, Norwegian Air Shuttle (Norwegian.com) (Norwegian Long Haul), Norwegian UK, Ole Bull on January 3, 2018 by Bruce Drum. Norwegian has entered into a lease agreement with CIT Aerospace to lease two new Boeing 787-9 Dreamliners with deliveries in the spring of 2018. The latest agreement means that the company will have a fleet of 42 long-haul Dreamliners before 2020. Norwegian currently has eight 787-8 Dreamliners and two 787-9 Dreamliners in the long-haul fleet. Norwegian is also exercising eight Boeing 737 MAX 8 options. The Group already has 100 MAX 8 aircraft on order and is the launch customer for Europe. Copyright Photo: Norwegian Air Shuttle (Norwegian.com) (Norwegian Long Haul) Boeing 787-9 Dreamliner EI-LNI (msn 37307) (Greta Garbo) LGW (Robbie Shaw). Image: 932746. 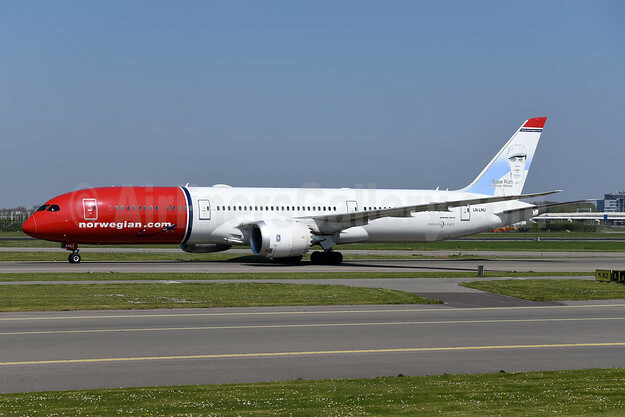 This entry was posted in Norwegian Air International, Norwegian Air Shuttle, Norwegian Long Haul and tagged Boeing 787-9 Dreamliner, EI-LNI, Greta Garbo, LGW, msn 37307, Norwegian Air Shuttle (Norwegian.com) (Norwegian Long Haul) on May 24, 2016 by Bruce Drum.